Each classroom has a number of digital tools such as ipads, chromebooks and desktop computers available for student use. Students use the devices to present work, create documents, search for information on trusted websites, make digital presentations and share their learning with you via their Seesaw Online Learning Journal. 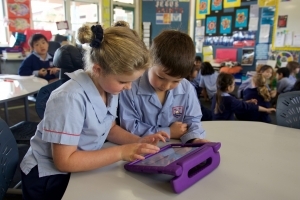 Students in Years 4 – 6 are given the option to bring their own device to school (BYOD). BYOD is totally optional as classes have digital equipment that your child can use. The type of devices that are currently used in Years 4-6 are tablets, ipads, chromebooks and laptops. Mobile phones are not allowed. The link below from Netsafe gives helpful information and advice for parents. All students and parents in Years 4 – 6 must sign a contract about the use of digital tools at school and where applicable, a BYOD contract, before a device is brought to school. Students in Years 1 – 3 work with their teacher through the guidelines of how to look after the school devices and how to keep safe when working on them. Click below to view copies of these documents.